This article is the first in a series that will take readers behind the scenes of student publications, programs, productions and lab experiences. 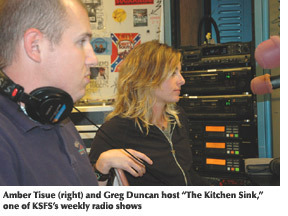 Radio and television majors Amber Tisue and Greg Duncan chat about music, parties and school while playing their favorite tunes as the hosts of "The Kitchen Sink," a weekly program on student radio station KSFS 100.7 FM. "I went to an awesome PJ Harvey concert this weekend," Tisue says over the air. "That's my girl. We'll be playing lots of her today." The 35 DJs on KSFS, which was founded in 1949 and is run from several rooms in the Creative Arts building, have the freedom to play whatever they like -- so long as it's devoid of George Carlin's seven dirty words. They have a lot to choose from -- there are thousands of CDs and records in the station's library. The result is a diversity of programming rarely found on mainstream radio. On any given day listeners can enjoy varieties of music that span the globe, from old-school hip-hop, Latin music and 1980s new wave, to jazz, heavy metal and Indian music. There's even a sports talk show and a morning talk program. "If we can get a fraction of the diversity of this campus onto radio, that's a good thing," says Chanda "Ed" Khatso, station manager and graduate student. When Khatso is not in class or studying, he is constantly at work for KSFS. It's his job to improve the station and make sure operations run smoothly. Like all KSFS staffers, he dreams of a day when the station could be heard beyond its online audio stream (media player required) and campus cable connection. He is working to get the station on the air in the Cesar Chavez Student Center. Professor Rick Houlberg, the KSFS adviser since he joined the Broadcast and Electronic Communication Arts Department in 1982, said it's important to allow students to make mistakes, so they can learn from them. "I can't make this a great station, but I can sure make it a great lab and educational experience," Houlberg said, noting that many internships at Bay Area radio stations have led to entry-level jobs for students. "We hope to turn out people who are good broadcasters and communicators. There's a lot more to radio than pushing buttons." The station is a bridge to successful broadcasting careers for many graduates, including now-retired CBS 5 anchor Dave McElhatton and Radio Alice 97.3 FM personality Sterling James. Jairo Vargas, co-host of "Soul Shakedown" on Thursday afternoons, is an aspiring television broadcaster who originally had no intentions of doing radio. "I came in and fell in love right off the bat," he says. "The freedom of being on the air and playing what I want to play is great." The KSFS production studios are equipped with ProTools software and digital equipment. The tedium of cutting and splicing reel-to-reel tape is merely a historical concept to today's students. Mandy Brown, the station's production manager and a graduate student, plans to pursue a career in radio theater. Having produced an old-fashioned whodunit mystery that follows a detective in San Francisco, she enjoys creating visual pictures for listeners using words, music and ambient sounds. "People can hear me, but they can't see me," she says. "This encourages imagination." Khatso, who loves music and alternative radio but rarely watches television, agrees. He sees himself as a stimulator of imagination and a "music educator." "On television, you have the imagery created for you. On radio, you create the imagery yourself," he says. Before joining KSFS, students must take a prerequisite in BECA 305. Then they are free to register for BECA 505, the course that gets them on the air.